Bring summer inside with these fun flip flop pillowcases. 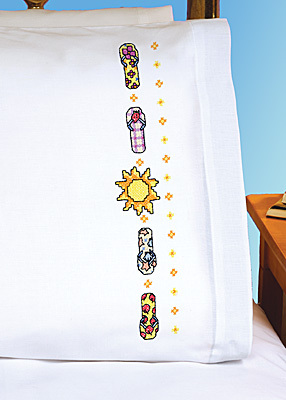 Dress up the beach house with your favorites and enjoy stitching this stamped cross stitch by Designed by Sandra Garbrandt. Cotaines: Two polyester / cotton blend, machine washable, stamped pillowcases, graph, instructions. Approx. 20" x30" Floss not included.